With a personable and common sense approach we have provided instruction for beginners, intermediate golfers, and professional golfers for 20 years! Plus we have a Scholarships producing Junior golf program. If you need to strike the ball better, get rid of a slice, better your short game we can do it! Build a swing that will hold up under competition pressure, we can do that. There are many ways to hit a golf ball, but some ways will be more effective than others for you. With consideration to your age, athletic ability, physical limitations, practice habits, goals, etc, we try to develop an effective swing plane that allows the body to rotate efficiently and/or an efficient body pivot that allows a natural, effective swing plane, so they work together. My goal is to help YOU with what YOU want, to develop consistent, dependable, shot making. As a PGA Professional, you are guaranteed that you and your time will be given the utmost personal attention, respect and conscientiousness that may not be found at stores or larger academies. For up to the minute info, specials and tips FOLLOW jpetersongolf on TWITTER and FACEBOOK! 1-hour-$90, Adult 5 hours - $360, 3 hours - $250, Junior golfers 5 hours - $300, 1hour 75$, or any custom program, just ask! Certificates can be (e)mailed with called in Visa and Mastercard, Am Ex. Certificates are good for one year from purchase date. Call 407-314-0104 or email jpetersongolf@hotmail.com AN EXPERIENCE THEY WILL REMEMBER!!!!! University High School Jordan McKendrick for 1st team Daytona Beach News Jrnl All Area Team. Kenna Kelting for 2nd team and Coral Estes and DeLand's Ryanne Ferriero with Honorable Mention. 19 handicap Joe who had the lowest score of his life of 83 at Troon after two months of work! Congratulations to sophomores Jordan McKendrick, Coral Estes and Kenna Kelting on being named to the First Team Daytona Beach News Journal All Area. 2 handicap Brian for winning Club Championship after spending an hour eliminating unnecessary moves in his swing. He is now a 0 handicap. Beginning golfer Joe after his first session " I have to tell you that was more enjoyable than I expected"! Tom M for breaking 80 for the first time with 76! Keith Greene who qualified to play on the Canadien PGA tour this summer. Vincent on qualifying for the Golf Channel Amateur Tour National Championship! Chuck Messier in 5 months has went from a 26 handicap to a trend of 15! Melinda Morgan on her 2nd place finish at the Volusia County Womens Championship. Rich for bringing his index from 30 to 22 in 4 months! Jane on winning the DeBary Golf and Country Club Championship! Mike Dombrowski a two handicap for his Club Championship win after his very first golf lesson in his life two weeks prior. Congratulations to John Henry for qualifying for the Florida State Mid Amateur Championship and winning the City of DeBary Championship! After many years of playing, Cathy Valley one month after her first lesson breaks 100 for the first time. Barbara Baker who has brought her handicap from 30 to 22 in three months! Jane Rossi for bringing her hanicap from 45 to 36 in 7 months. Dr. Carlos Lopez who shot his first even par round of 72! Retiring 29 handicapper Gary House scoring 87-85 after 8 months of quality work! Pete W who has dropped his hdcp from 14 to 10 after 3 sessions and 4 months! Adult 5 hours - $360, 3 hours - $250, Junior golfers 5 hours - $300, or any custom program, just ask! Certificates can be (e)mailed and Visa and Mastercard are accepted. Certificates are good for one year from purchase date. Call 407-314-0104 or email jpetersongolf@hotmail.com An experience they will remember!!!!! Nothing beats individual attention. Lessons are sixty minutes and the cost is $90 or a package of 5 for $360 and includes notes and a take home CD of your lesson. $20 for additional people. Scheduled at your convenience. 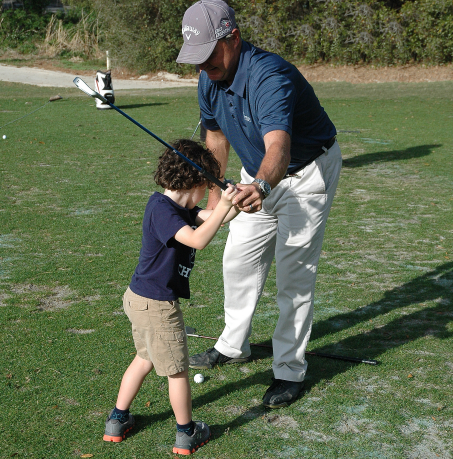 In addition to private lessons, we offer a beginner series, personalized golf schools, and golf clinics. Click here for more information. Spend 3, 6 or 9 hours with your friends or business contacts learning how to score lower, improving swing fundamentals and increasing confidence at an accelerated pace. Design your group's "School Day", a sample day may consist of instruction from 9 am to Noon, followed with lunch in the grill room, then play at DeBary or other Orlando to Daytona Beach golf courses in the afternoon. Call or Email to set up and for pricing information. Hour Private lessons are available for the junior at $75 an hour or 5 hours for $300. Private JUNIOR DEVELOPMENT PLANS are also available, please call or email for more information.Scheduled at your convenience. Take home Cd And notes. Click here for more information. Held through the summer mornings, a great way for your child to learn about golf. All Day Activity Camp also available. Few camps have the PGA professional actively participating in the actual instruction. Check for camps that may be held during school breaks. Call or email for more information.